(Moosic, PA) Chris Richard had one of three Bulls homers in a seven-run seventh, as Durham pulled away from Scranton to win 11-3 over the Yankees affiliate. The Bulls (31-23) took three of four in the series, and won the season series, 5-3. JJ Furmaniak started the seventh inning uprising with a single to left, and Elliot Johnson did the same against Jason Hirsch. 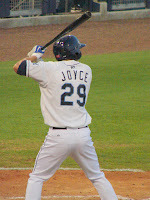 Matt Joyce then hit a towering three-run homer to right for a 7-3 advantage. After Ryan Shealy singled to right, chasing Hirsch, Richard hit a two-run bomb to right off Mark Melancon for a 9-3 advantage. Alvin Colina added a two-run homer off Melancon to cap the seven-run rally, Durham's biggest inning of the season. The Bulls had built up a 4-0 lead against Tim Redding (0-1), scoring one in the second and three in the third. However, Scranton countered with three in the bottom of the frame against Carlos Hernandez to make it 4-3 contest. Hernandez and three other relievers combined to hold Scranton (31-23) in check the rest of the night. Durham held the Yankees to eight runs in the four-game series. Durham collected 19 hits, one shy of a season-high. Alvin Colina led the way going 4-for-5. Colina and Richard drove in three runs each, and Joyce had five RBI. The Bulls, who have a season-high 6.5 game lead in the South Division, start a four-game series against Nationals affiliate Syracuse on Friday. RHP Jeremy Hellickson will be on the hill against LHP Matt Chico. Air time on 620 the Buzz is at 6:45, with first pitch at 7 p.m.